REGGAETON CONCERT FT. DE LA GHETTO & MORE COMING TO CROWN COLISEUM JULY 22! 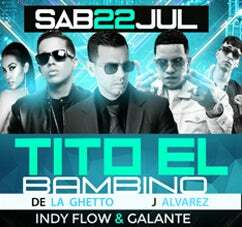 DE LA GHETTO, TITO EL BAMBINO & MORE SET TO PERFORM AT THE CROWN COLISEUM JULY 22! Fayetteville, NC (June 15, 2017) - Surge Production presents The Lavish Affair concert which features reggaeton superstars De La Ghetto & Kevin Roldan. The Lavish Affair will be held at the Crown Coliseum on July 22 at 7:00 p.m. Ticket prices start at $53 and are on sale now. Tickets are available online at www.CapeFearTix.com, by phone at 888-257-6208, and in person at the Crown Complex Box Office and the Leisure Travel Ticket Office located on Fort Bragg. Tito El Bambino One of the pioneers of reggaeton, Tito "El Bambino" was half of the trailblazing duo Hector & Tito before he embarked on a solo career of his own, signing with EMI Televisa and debuting in 2006 with Top of the Line. El Bambino has received accolades such as receiving both a Billboard and Grammy award. His breakout hits include Aye Mai and No Tengo. Kevin Roldan is a Columbian songwriter, singer, rapper, producer, and collaborator. He has been pursuing a professional music career since he was 13 years old, working in reggaeton and urban pop. Now at the age of 24 years old, he has several hit records under his belt such as Ruleta Rusa, Por Que Signues con EL and Salgamos. De La Ghetto, Tito El Bambino & more!